Happy Kitchen Sink Stamps Monday! Thanks for stopping by, I hope you had a great weekend! The weather was in the upper 40's this weekend, Spring is just around the corner and I can't wait! I'm still playing catch up in my studio, after having to take some time off for my foot to heal. I'm hoping I can get my shoe back on this week, as it was pretty funny to see me in the Grocery Store with DH's hiking boots on. This week Kitchen Sink Stamps is the Sponsor for the Color Throwdown Challenge Blog! Be sure to stop by their blog on Wednesday to read more details on how you can enter this weeks challenge for a chance to win a prize from Kitchen Sink Stamps! 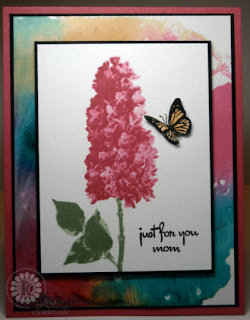 I used the color challenge as an opportunity to create a card for my mom's birthday using the beautiful Multi Step Lilacs from Kitchen Sink Stamps. Mom's an artsy type of person, so I thought the colors would work pefectly as a background instead of incorporating them into card stock panels. I used the Reinker Splash Technique from a past TJNL using Melon Mambo, Marigold Morning and Bermuda Bay colors from this weeks challenge. Melon Mambo was a great color choice for the Lilac (click photo to enlarge). The last color in the Color Throwdown Challenge is Wild Wasabi, I used that for the stem and leaves. Wanting to fill in a bit of the white space, I stamped the sentiment from Ready 4 Any Holiday in Black Memento, and added the Butterfly from the 3 Step Hydrangea. Be sure to stop back later this week, as I'll be posting samples with the new Multi Step Horseshoes and Shamrocks & Clovers sets. I love the hydrangea. If I wasn't in so much trouble for all of the stamps in my house :). Beautiful! This is just stunning, Lisa! The background you created is just perfect!! Love how you used just a touch of these colors...beautiful!! Oh la lilacs! I just love it, the bg is perfecto! If I were your mother, I would have a very happy birthday after receiving this card. I LOVE the background what a neat idea! I love the overall look of the card as well. Love your gorgeous background, Lisa! How perfect for showcasing this stunning lilac!! So beautiful card and love that pretty background. The background is fantastic Lisa. Beautiful card. Gorgeous- I love that stamp- your colors are so pretty! I am trying to have will power.....I am trying to have will power.......! Beautiful card, Lisa! I LOVE how you added the butterfly! GORGEOUS! reinker splash was the first TJ technique i ever did and has always been one of my faves!